Water metering implies a system of measurements and record of water volume at irrigation & drainage and water management facilities. Water metering allows controlling water resources use and forms the core of the centralized control of water distribution and water supply in irrigation systems. According to functional features, the inter-farm part of the system includes the site of head water supply, commanding and water distribution nodes, and water delivery points to farms; the on-farm part of the system includes on-farm water distribution nodes, water delivery points to crop-rotation land plots. The section of head water supply with water intake by pumping includes a pumping station, pressure pipeline, and stilling pool; with gravity water intake – head water intake structure, upstream section of the main canal down to the main gauging station. In both cases, the head water supply section includes a reach of river or reservoir with special structures (weir, dams, mountings, etc.) and supporting gauging station on the irrigation source for determination and accounting of water resources as well as the main hydrometric post at the head of the main canal for accounting of water intake to the system. Among the commanding nodes are hydrotechnical nodes in the main network, with which the water level and flow quantity in the main canals will be kept. A part of the main canal is attributed to a certain commanding node, which helps maintaining a required water level and feeds the points of water delivery to the farms that receive water directly from those nodes. Such nodes have discharge outlets and sometimes special discharge ducts (canals). Among the commanding nodes are hydrotechnical nodes that distribute water to lower-order inter-farm canals and to the points of water delivery to farms. 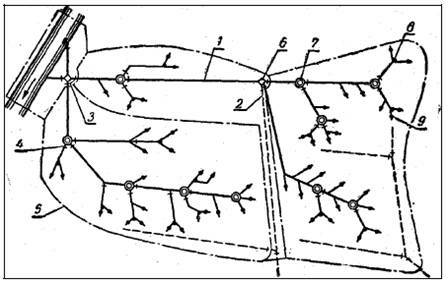 The water distribution node is considered to cover the canal section with all the structures on it, through which water is delivered to the node from an upstream node, as well as the canal sections that supply water to the delivery points attached to that node. The water delivery point to a farm is a water outlet to a farm canal or a station on the canal, where water is actually conveyed to the water user. All the irrigation canals and structures on them located upstream of the points of water delivery to farms are attributed to the inter-farm part of the system; they are on the books of and served by state-run operation organization, so-called Irrigation Systems Administrations (ISA). The on-farm part of the system is located downstream of the points of water delivery to farms; it is on the books of and served by farms themselves, i.e. water users, or on their account. In on-farm irrigation network, water distribution nodes and points of water delivery to crop rotation plots are distinguished similarly. All the water delivery points, commanding and distribution nodes in both inter-farm and on-farm irrigation networks should be equipped with water-gauge facilities that allow distributing water at specified flow rates (volumes) according to relevant water use schedules. The node-based system operation management scheme (with concentrated water apportioning sites) is more rational and easy to use in comparison with the linear scheme (with dispersed water apportioning sites). According to its area, the system is divided into production sites (OS), which in turns can be subdivided into hydraulic sites (HS). Each production site (or hydraulic site) includes one or several water distribution nodes with all the water delivery points, command areas, canals, structures, and facilities attached to it. The boundaries of the sites are defined taking into account the boundaries of commanding by water distribution nodes, boundaries of administrative districts, and farms–water users. The water distribution node with all water delivery points and command areas attached to it should be served only by one site (OS or HS). The canals of the waste and collector & drainage network with structures on them are to be attached to a certain node if they divert water only from that node and its command area. Large waste and collecting canals serving several nodes can be singled out as an independent production site. Scheduled water use is based on water accounting in irrigation systems. Provision of the system with required data for water accounting and control in any water diversion and distribution point; compiling of actual data of operational hydrometry for proper and timely technical maintenance of the irrigation system. Three times per day (at 7 a.m., 1 p.m. and 7 p.m.) at instrument-based accounting. Accounting of the water received by farms is executed at least twice a day. Gauging stations are installed in the irrigation system for water accounting. It is required to install an average of 10-12 gauging stations per 1000 ha of irrigated area for ensuring proper water accounting. 1. Stations for accounting of irrigation source water reserves, i.e. control network communication stations or reference gauging stations. They serve for transferring hydrometric data from river gauging stations of the Hydrometeorological Service to the water intake point of the irrigation system (if needed, additional reference gauging stations can be installed). If surface water bodies (ponds, lakes, reservoirs) serve as irrigation sources, they are to be equipped with dipstick or sectional staff gauges; in addition, channel control sections are to be installed. 2. Water balance accounting stations. These stations are designed for accounting of the water coming to the system and particular balance plots and dumped from them. They are installed at the head of the system, at the borders of balance plots, in collector and drainage network, at transit reaches of canals. 3. Real-time water accounting stations. These stations are used for water distribution over the canal network of the system; they are installed at all the water distribution nodes (except the last ones – for each inter-farm canal, where on-farm stations are used as real-time accounting stations). 4. Stations of accounting of water delivery to water consumers (on-farm stations or stations at the points of water delivery to farms). They are used for estimation of the water volumes supplied to farms per one day/ten-day period. 5. Stations in the on-farm irrigation network for accounting of distribution and control of water use by water users of a given farm and for setting actual water application rates. In addition, sometimes stations for water level observation are provided for on canal reaches with dams, and special stations for conduction of research and exploration works. 4. Select the suitable type of a water meter (gauge). For the third paragraph: Depending on the results of examination made according to Paragraphs 1 and 2, to select proper types of gauges suitable for water accounting in this cross section. Depending on financial possibilities, availability of local building materials, and other factors, to select the proper type of gauge finally. All the above-listed gauges meet the requirements of Standards and Regulations, which enables manufacturing and using such gauges without individual calibration. Below, we shall consider the most widely used standard weirs of Thompson and Cippoletti and SANIIRI (Yartsev) flumes, which are designed for metering water discharge in the on-farm irrigation network. TW-50 is intended for metering water discharge of up to 50 l/s. TW weir is made both of portable and stationary type. Its framework consists of a triangle-shaped weir with edges converging at an angle of 90о, made of 3-mm-thick sheet steel; a stiffening angle and a gauging rod fastened on the weir wall aslant (45о) or upright (90о). The TW weir crest edge directed to the weir inlet should be sharp, beveled at 45о. Cippoletti weir CW-50 (in Russian ВЧ–50) is intended for irrigation ditches with the discharge measurement range from 5 to 80 l/s; CW-75 (in Russian ВЧ–75) is designed for irrigation ditches with the discharge measurement range from 15 to 230 l/s. 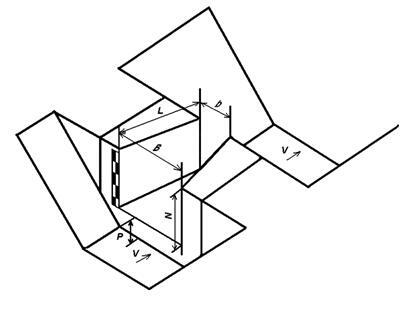 CW-50 is classified as a trapezoid-shaped weir with a thin wall with side slopes of 1:4. It is made of sheet steel 3-4 mm thick and angles for reinforcing the construction. The weir crest width (b=50 cm) is made to a tolerance of +2-3 mm; other dimensions, to a tolerance of +5-10 mm; the edge of the discharge sluice should be flat, smooth, without dimensions notches and protuberances. CW-75 is made of 4-mm thick steel; its discharge sluice should be smooth, without notches and protuberances. The basic size of the crest is b= 75 cm, made to a tolerance of + 5 mm; other dimensions, to a tolerance of +10 mm. The width of TW and CW weir crests is made to a tolerance of +2-3 mm; other dimensions to a tolerance of +5-10 mm; discharge sluice edge should be flat, smooth, without notches and protuberances. Edge of TW, CW weirs' crest is to be sharp, beveled at 45о, directed poosite to the stream. The gauging rod is to be manufactured at a specialized plant from metal coated by waterproof paint. Graduation marks and numbers should not be worn away, and the zero points of the gauging rods should coincide with the weir crest level; the entire metal framework is to be painted with anticorrosive paint in three coats. if flow velocity exceeds 0.5 m3/s, the canal approach section upstream the weir should be widened, and the bottom should be deepened to slow down the flow velocity. Note: To mount weir crest strictly in the horizontal position and to bind its crest elevation to the zero point of the gauging rod, it is recommended to use a leveling instrument or a hydraulic level tube using to this effect a long small-diameter transparent hose filled with water (law of communicating vessels). H is water head above the weir crest, m.
repair (cleaning from sediment load, elimination of defects, painting, replacement of gauging rods, etc.) the weir facility at least once a year. 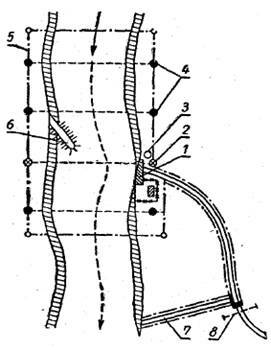 For small canals in WUAs it is recommended to build SANIIRI flumes, while other flume types (Parshall, Venturi) are not recommended to be built, because they are difficult to make. 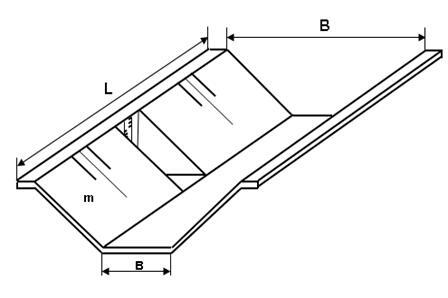 SANIIRI gauge flume (SWMF) represents a short flume with vertical walls converging to the tail-water part and the horizontal bottom. Coupling of the flume with a canal in its head-water and tail-water parts is performed by means of wing walls; at that, a basin is installed in its stilling (bucket) section. Elevation of crest P above the canal bottom is unnecessary. The gauging rod is fastened to the front wall of the flume; the rod zero point should coincide with flume bottom elevation. SANIIRI flume is intended for measuring discharges at free flow. Free flow for SWMF is achieved at h ≤ 0. Declination of the side walls of the throat of the flume from vertical line should not exceed 2 mm per 1 m of the wall height. The bottom of the throat or inlet socket of the flume should be strictly horizontal. Declination should not exceed 1 mm per 1 m of the throat length (or width). Submergence of the flume bottom at its tail-water part must be avoided. If SWMF is built properly, water flow comes to the stilling basin in the gauging station’s outgoing section without submerging it, i.e. the condition h ≤ 0 is fulfilled. In the water accounting practice, if there is a need of accounting of high flowrate or if flow regime has non-steady nature, a gauging station of fixed bed (FB) type with a gauging rod is to be installed on the straight unlined section of the canal. To obtain the discharge characteristics Q = f (H) it is necessary to make individual graduation marks “FB” (stands for fixed bed). Fixed bed can be made by using concrete slabs or cast-in-situ concrete at least 5 cm thick to make the lining resistant to mechanical effects and wash-out by water stream. At operating variable flow regime at FB-type gauging stations it is necessary to carry out check measurements of water discharge after any change of the level. At canal flow velocity of less than 2 m/s, a permissible length of the canal reach, where mentioned conditions are to be fulfilled, should be at least L = (6 - 8)*В depending on the canal surface width (B). Parabolic flumes of LR-40; 60; 80; 100 (in Russian ЛР-40; 60; 80; 100) types have gained widespread currency in the irrigation practice. These water conveying facilities can be classified as FB variety. Water metering in these flumes is performed by calibration and getting discharge characteristic Q = f (H). A calibrated parabolic flume (CPF) is a site (station) equipped and calibrated for carrying out regular water accounting. CPF includes one section of LR flume and measuring section (working) for metering depth and flow velocity, a bridge fixed on it, a stilling well (basin) with a gauging rod or flow-measuring scale marked on the slope. The selected section and adjacent sections of flumes must be in good order with equal gradient.расходомерной шкалой. Выбранная секция и соседние секции лотков, должны быть исправными с одинаковым уклоном. Source: Guidelines for selecting the type, site, and installation of water meters in the WUA.